On the 14th day of June, 1946, Brother Branham, his family, and two sisters from his church left Jeffersonville for St. Louis where he was to begin his first healing campaign. It was a beautiful morning and a sense of excitement filled their hearts. Bro. Branham himself would recall many times, his last service at the Tabernacle before going into the Evangelistic field to fulfill the recent Words of the Angel and the vision which the Lord gave him one Sunday morning in 1933, just before he laid the cornerstone for Branham Tabernacle. In that Vision the Lord told him to "Do the work of an Evangelist and make full proof of the ministry committed to him". Neither did God's Servant forget the 'special' in that service, sung by some sisters at the Tabernacle: "They come from the East and West; They come from the lands afar; To feast with the King, to dine as His guest; How blessed these pilgrims are!" At four o'clock they reached the City of St. Louis, where the party had pre-arranged to meet Rev. Daugherty at the end of the large McArthur Bridge which spans the Mississippi River. His car was there, posted with signs of the coming revival. Brother Daugherty met them and took them to his home. The party was greeted by the family, including little Betty, who had been healed a few days before. That evening they all went to the large tent where Brother Branham was to preach. As he explained to the congregation what God had done for him, the people listened with evident interest and attention. Eighteen people were prayed for that night. Among these was a man that had been crippled for years. After prayer was made in the Name of Jesus, he arose clapping his hands and walked unaided. A blind man was healed and several had deaf ears opened. On the following morning Brother Branham was asked to make a sick call in the psychopathic ward of the St. Louis Hospital. The insane woman was restored to normal and later obtained her release. They drove over to Granite City, Illinois and found a woman weighing about 83 pounds suffering with cancer. After prayer God touched her body and she was then asked to dress and go home. At the next home they visited there was a lady who had been paralyzed in her right side for about a year. Brother Branham prayed for her and then commanded her to rise in the Name of Jesus Christ. She obeyed and immediately raised her right hand above her head and stood alone. Then she walked back and forth across the room, clapping her hands. Her voice, which had been gone, was restored, and she was able to speak. When the party returned to the tent that evening they found it crowded. Many stood outside in the rain and others were in cars parked nearby. Again the service was blessed, with a number of wonderful healings taking place. As the meetings continued from night to night miracles of even a more outstanding nature took place. Heavy unseasonable rains were falling but it did not deter the people from attending. They brought old newspapers with them and used them to cover the wet seats. More chairs were provided, and these were quickly filled with many left standing. On Sunday evening a colored minister, who was totally blind in both eyes and known by many in the congregation, came forward to be prayed for. After prayer Brother Branham held out his band, and the colored man called out, "Reverend, I see your hand." Then he looked up and saw the lights. He cried, "Praise the Lord, I can count the lights in the place and can see the cross-arms they are hanging to." The people glorified God for this great miracle, for many of them had known this colored minister to be blind for approximately twenty years. A woman that night that rejected the call of the Spirit left the meeting, but had gone only a few steps when she suffered a heart attack and fainted on the sidewalk next to a tavern. Brother Branham went out and prayed for her, after which she arose and confessed how she had resisted God's call to her heart. The services had only been scheduled for a few days, but now several ministers of the city came to the room where he was, urging him to continue the meeting for longer than he had planned. After kneeling down and asking God for Divine guidance, Brother Branham said that the Lord willing he would continue. The interest in the meetings increased from night to night, and police appeared to see that all was in order. Testimonies of healing were now coming in. One of the first to be prayed for in the campaign was a little lady about seventy years of age, whom the party had noticed had a cancer on her nose about the size of a small egg. Now, less than a week later, she returned to tell that it had gone. Many other testimonies were given. Of course the testimony of little Betty Daugherty, who demonstrated that she was now sound and well, was very impressive. A minister who could not raise his arms was prayed for. He then raised his arms in the air and praised God. Many deaf and dumb were healed in the meetings and demonstrated that they could hear by repeating words to the congregation. A woman being able to walk without braces praised the Lord. A woman suffering with lock-jaw and arthritis was instantly healed. She was able to open and shut her mouth easily. And so the healings multiplied and were beyond count. With the great number to be prayed for increasing nightly, Brother Branham often would pray until 2 o'clock in the morning. This practically became a custom for him from that time on for many months. So great was his compassion for the sick that it was difficult for the evangelist to leave the people. We saw indeed the Spirit of the Living Christ made manifest. The campaign continued until June 25. On the following morning he returned to Jeffersonville, Indiana. He had received another telegram from a little girl's parents, who said that their daughter was in a serious condition. When Brother Branham appeared at the hospital room he prayed for her and Jesus touched her body. She then dressed and went home, sound and well. 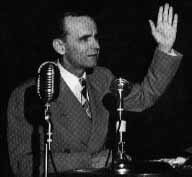 Sometime later Brother Branham returned to St. Louis to speak in the Kiel Auditorium for a one-night meeting. Some 12,000 packed into that great building to hear him at that time.